Epiphany Bridal Boutique is coming back to the San Francisco Airport Marriott for a blow-out Bridal Gown Stock Sale! NOTHING is being held back! FULL DETAILS AND APPOINTMENTS AVAILABLE HERE! 2019 Wedding Dress Stock Clearance Sale! Through January 31, 2019! It's been a LONG time since we've had a store wide sale! We're starting 2019 with a HUGE one! For the entire month of January, every wedding dress in our store is 20-50% OFF. This sale includes new arrivals! Don't miss this opportunity to find your dream dress AND save $$$$! Pictured here are some gorgeous gowns from our Willowby by Watters and WTOO by Watters. Epiphany's Ten Year Anniversary Celebration! Epiphany Bridal Boutique is TEN years old! Meet our favorite local wedding vendors that you will want to have for your wedding! We’re welcoming all our brides (current and already married), vendor friends, and all that have been a part of our history! 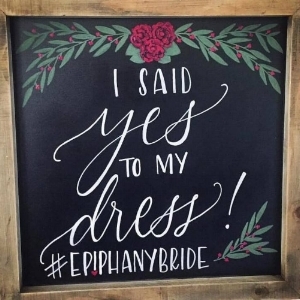 For our future Epiphany Brides - RESERVE YOUR BRIDAL SHOPPING EXPERIENCE TODAY! Epiphany's November Thanksgiving Weekend Showcase! One of our biggest events of the year! This year, our Bridal Showcase will be held Friday, November 24 - Sunday, November 26, 2017. Straight off the Runway - The 2018 Collections featured: Willowby by Watters, Justin Alexander, Badgley Mischka. We'll have the complete collections of new gowns in for this exclusive event. You'll also be able to preview the newest arrivals for 2018 from all our designers! Wine tasting, Happy Hour Signature Cocktails with Pour Girl Bartending will be on Saturday, November 25 from 2-5 pm! Don't miss it! Cake tastings, appetizers and meet&greet with our favorite wedding pros and much more. 2 Weekends of Evelyn Bridal! The newest 2018 collection will be featured here at Epiphany and we couldn't be more excited! Beginning October 6 thru 15, 2017, come see the entire collection. We'll be offering a 10% discount for all Evelyn Bridal gown orders placed during the trunk show days. In addition, Epiphany Boutique includes FREE alterations and a custom veil with each gown. We're kicking off our bridal season with one of our top designer collections - Essense of Australia! 3 DAYS ONLY! - RESERVE YOUR SPOT TODAY! Let us know if you have any questions prior to your appointment.